What are the Best Online Master's in Graphic Design Programs? As artists and information communication experts, graphic designers create visual media for print and electronic platforms, including logos for websites and graphics for newspapers and magazines. They can work for design firms, advertising agencies, video game companies, publishers, and multinational corporations. Some professionals pursue self-guided careers as freelance designers and entrepreneurs. The rapid global expansion of digital media and online business ventures creates plenty of professional opportunities for experienced designers. The U.S. Bureau of Labor Statistics (BLS) projects the number of jobs in the graphic design and related fields will grow through 2026, including a 10% increase in advertising and marketing positions and 15% increase in web development positions. An online graphic design master's degree prepares students for careers through design theory, skills training, and professional development. This guide provides important academic and financial information for prospective graphic design students. Syracuse University welcomes students of all educational and professional backgrounds to pursue a online graphic design master's degree. The school's 60-credit master of fine arts in illustration curriculum features a blend of studio work and art history, making the program accessible to graduates and professionals from different art disciplines. Students take 24 credits of major studio classes, 12 credits of studio electives, and 18 credits of art history and elective courses. The three-year online graphic design master's degree concludes with a three-credit graduate seminar and three-credit final presentation. Applicants must hold a bachelor's degree and submit unofficial transcripts, an art portfolio along with an artistic statement, a 500-word personal statement, three letters of recommendation, and a professional resume. New York residents and out-of-state students pay the same tuition. Savannah College of Art and Design offers several online graphic design master's degrees. Students can pursue a master of arts or a master of fine arts in graphic design or illustration. Courses in the MA program include typographic communication, integrated design media, and visual analysis of static content. Courses in the MFA are the same as in the MA program but require additional research, an internship, and a thesis. Asynchronous instruction in all programs makes it easy to balance work, life and studying, with weekly assignment deadlines to keep you on track. Applicants must hold a bachelor's degree and submit unofficial transcripts, a portfolio of work, a personal statement, two academic letters of recommendation, and a resume. Tuition costs the same for in-state and out-of-state students. SCAD also offers a number of academic scholarships. Located in Hamden, Connecticut, Quinnipiac University provides a unique graphic design master's degree online. Through certain elective sequences, the 30-credit master of science in interactive media and communications also comes with certificates in user experience design or social media. The program is divided into nine core courses and 21 credits of electives, including motion across media and media ethics and policy. A capstone experience helps students convert their work throughout the program into a professional portfolio. Applicants should have a bachelor's degree from a regionally accredited institution and submit official transcripts. Other application materials include an online portfolio of written, visual, and/or audio work; a 500-word personal statement; two letters of academic or professional recommendation; and a resume. In-state and out-of-state students pay the same per-credit tuition. A master of professional studies in graphic design from Maryland Institute College of Art focuses on developing practical skills and understanding the design and computer science sides of user experience. Students earning a master's in graphic design online complete a 30-credit curriculum in as few as 15 months. To foster student relationships and networking, MICA requires three separate three-day on-campus residencies in Baltimore. The program concludes with a five-credit thesis and reflection course. Prospective students should ideally have a background in game, graphic, or industrial design. An interest in computer programming or human-digital interface is also beneficial. Applicants must have a bachelor's degree, as evidenced by official or unofficial transcripts. They should also submit an artistic portfolio, personal statement, three letters of recommendation, and a resume. In-state and out-of-state students pay the same per-year tuition rate. Samford University in Birmingham, Alabama, offers an online graphic design master's degree through its Department of Interior Architecture. The master of science in design studies develops students' critical analysis and design research skills in a cohort program lasting 24 months. The 33-credit curriculum features core courses in interior design, architecture, and design theory. Students also take applied practice and research courses, and conclude the program with a thesis. Applicants typically hold bachelor's degrees in related fields such as architecture, landscape architecture, and interior design. Prospective students should also have professional design experience. All students pay the same per-credit tuition rate regardless of their state of residence. Located in Virginia, Liberty University offers a master's in graphic design online with no on-campus requirements. The master of fine arts in graphic design consists of 60 credits, including 30 credits in core courses, an internship, and a practicum. Core courses include subjects such as character design, 3D graphics, and vector illustration. Full-time students can finish the program in just six semesters, concluding with a thesis/portfolio project. Applicants must hold a bachelor's degree with a cumulative GPA of at least 3.0, though conditional admission may be granted to students with lower GPAs. You also need to give an artist statement and artistic portfolio with exactly 20 work samples. Transfer students with at least 30 graduate credits from a related program do not need to submit a portfolio. Online students pay the same tuition rate as Virginia residents, with full-time students receiving a slight discount compared to part-time students. Ball State University's master of arts in emerging media design and development is distinctive among online graphic design master's degrees for its emphasis on storytelling as a marketing method. The 36-credit curriculum explores design planning, human-digital interfacing, and cross-platform storytelling through 18 credits of core courses and 18 credits of lab experience. Each semester, students complete a five-day on-campus residency in Fishers, Indiana. A thesis or culminating project concludes the program. Applicants must hold a bachelor's degree and need to provide official transcripts. Competitive candidates have an academic background in art, design, computer science, or technology. Additional application materials include a 1,000-word statement of purpose, a 2,500–5,000 word writing sample, and a design portfolio. Indiana residents receive discounted tuition, but over 75% of BSU's students receive financial aid. Kent State University's master of science in user experience design is an online graphic design master's program that requires just two years of full-time study. The 36-credit curriculum consists of nine credits of core courses, 27 credits of specialist courses, and a three-credit culminating experience. Courses include information architecture, content strategy, and user experience design principles and concepts. KSU's flexible culminating experience lets you write a thesis, a research paper, conduct research, engage in a project, or complete an internship. Applicants must hold a bachelor's degree and provide official transcripts, submit a goals statement, three letters of reference, and a resume. All students pay the same per-credit tuition rate regardless of state of residency. Named after Radford, Virginia, Radford University offers a master's in graphic design online. Consisting of 60 credits, Radford's master of fine arts in design thinking instructs students in five competency areas: design thinking, design history, design management, design doing, and research. Students complete all coursework, including studios, entirely online. Courses include international art history, design theory and research, and design management. The full program can be completed in two years of full-time study or four years of part-time study, and it concludes with a thesis or research project. Radford makes admissions decisions on a rolling basis for added flexibility in scheduling. All applicants must hold a bachelor's degree; competitive applicants have a cumulative undergraduate GPA of at least 3.0. Complete applications also require a statement of purpose, three letters of reference, and a professional resume. Virginia residents pay discounted tuition, and Radford also offer graduate assistantships for tuition assistance. Students completing graphic design master's programs online take many of the same core classes, and most programs have similar practicum, capstone, and portfolio requirements. Programs standardize parts of their curricula to maintain academic and professional accreditation. However, programs have many differences, particularly in advanced coursework; students should research specific requirements to choose the program that best fits their academic and professional goals. Art and design history: This course provides a historical and contemporary overview of visual design and its functions, with emphasis on media in modern culture. Students complete research and writing assignments. Future educators and creative directors benefit the most from these topics. Integrated design media: This class emphasizes critical thinking and problem-solving skills as they relate to the evolution of print, social media, and interactive visual experiences. Students gain compositional and technical skills that prepare them to creatively adapt to challenges within the design cycle. This course is crucial for professionals in advertising and product development. Design theory and criticism: Students analyze contemporary print and graphic design theories and the resulting practical changes. The course emphasizes correlational research techniques; students conduct studies to address current challenges in the design field. As a fundamental course in graphic design master's degree online programs, this class benefits all future professionals, particularly those who aspire to management positions. Typographic communication: Students learn to effectively use typography as a means of visual expression and to develop their own unique styles. Topics include clear communication practices, historical references, and current trends and styles, such as letterform anatomy and proportional system layout. This course is crucial for any graphic design artist or animator. User-centered strategy: Students analyze the emotional and psychological responses users have to the function and content of digital systems. Learners develop and assess their own user-centered service. Though this course is useful for all web-based artists and developers, it is required for user-experience and interaction designers. How Long Does It Take to Get an Online Master's in Graphic Design? Most online graphic design master's degree programs take two years to complete and require at least 30 credits. However, completion time depends on the program's structure and content. Most remote coursework is asynchronous, but some distance programs require live online classes. Some online programs are cohort-based to facilitate collaboration and communication among students and faculty. Students in cohort programs take one class at a time and progress through course requirements with a small group of peers. While this learning style may benefit working and part-time students, cohort programs typically take longer to complete. To shorten degree completion time, choose a program that offers an individually paced structure, a generous transfer policy, and accelerated, year-round online courses. Additionally, look for programs that allow distance learners to complete internships and capstone experiences locally. Adobe Certifications: Most graphic design positions do not require professional certification. However, Adobe's software is so prevalent in the design field that obtaining Adobe certification greatly improves career prospects. Adobe offers three certification categories: AEM Mobile, Analytics, and Campaign. Each exam costs $180. CIW Web Design Certifications: As a vendor-neutral information technology organization, CIW provides certification tracks in a variety of industry- and platform-specific skills, including e-commerce, mobile app development, and social media strategies. Additionally, all graphic designers benefit from the general CIW web design professional and specialist certificates. Requirements vary by exam. CIW certification does not expire. Online graphic design master's degree programs should hold national and regional accreditation to ensure they confer degrees recognized by government authorities and employers. Six organizations in the U.S. grant regional accreditation, depending on the location of the institution. These organizations ensure that schools adhere to certain state-specific academic standards. Organizations recognized by the U.S. Department of Education (ED) and the Council for Higher Education Accreditation (CHEA) award national accreditation to schools that standardize aspects of their institutional and curricular outcomes. Generally, employers prioritize regional accreditation. However, students should look for programs with both types of accreditation. 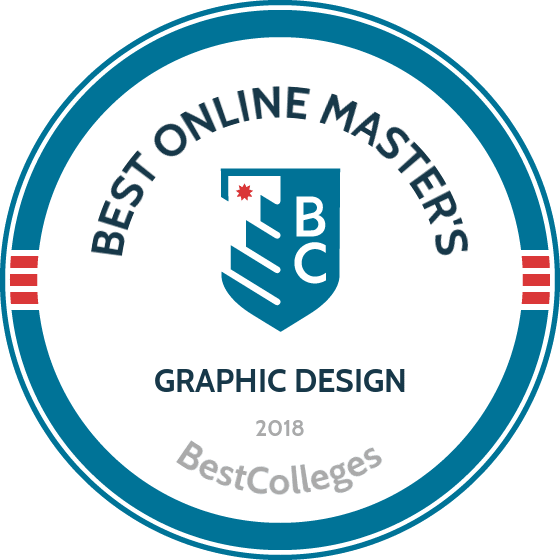 Additionally, online graphic design master's degree programs may hold accreditation from a field-specific organization, such as the National Association of Schools of Art and Design. Colleges and universities gain national accreditation through accrediting bodies approved by the ED and CHEA. Both organizations ensure schools meet defined academic and professional standards. As a government organization, the ED enforces federal education guidelines by overseeing federal funding and other resources. CHEA is a private nonprofit with more than 3,000 member institutions. In addition to professionally supporting member institutions and advocating for their rights, CHEA monitors standardization across curricula. Students planning to attend graphic design master's programs online can find information about nationally accredited programs on the ED and CHEA websites. The table below details the median salaries of five occupations for graduates of master's in graphic design online programs. Professional experience significantly impacts salary; professionals typically earn more later in their careers. Because the field of graphic design is grounded in technology, graphic designers need to stay updated on new software through continuing education and new certifications. Graphic designers are creative visual communicators who use artistic, technical, and business skills to create innovative content. Though graphic designers may function independently as freelancers and counselors, many professionals work as part of a design, marketing, or product development team. Below are some of the careers available to professionals with an online graphic design master's degree and professional training. These artists create visual concepts that convey messages for individual clients or organizational brands. Graphic designers possess advanced computer and artistic skills and in-depth knowledge of marketing and advertising strategies. Graphic designers hold at least a bachelor's degree, and most pursue additional training to increase earning potential. These professionals work with teams to create design content such as logos, advertisements, product packaging, and displays. Art directors oversee the evolution of a visual style or brand. They typically possess significant field experience, certification or licensure, and an advanced degree. Additionally, they must understand financial tasks and other daily business operations. Using animation software, multimedia artists create 2D and 3D animations, models, and visual effects for video games, television, movies, and other types of media. Most multimedia artists develop a portfolio as freelancers before securing positions in design firms or production studios. These professionals hold at least an undergraduate degree and typically pursue additional training in a particular medium. These professionals lead teams to create marketing campaigns and other promotional projects that generate interest for a particular product or service. They work with clients and company directors to develop business strategies and pricing plans. Advertising managers need at least a master's degree and must possess years of work experience. These visual communication experts design, create, and maintain websites for clients and companies. Web developers ensure websites are aesthetically appealing and function effectively. They also conduct performance, accessibility, and traffic analysis. Web developer positions require at least an associate degree, but most professionals eventually pursue graduate education. Professional organizations are integral to both individual success and the growth of the graphic design field as a whole. After earning a master's in graphic design online, graduates have the theoretical knowledge and practiced skill set necessary for careers in the field. However, membership in a professional organization greatly improves job prospects and opportunities for career advancement. In exchange for an annual fee, members gain access to networking events, such as conferences and chapter meetings, and internship and job announcements. Additionally, organizations such as the Society of Illustrators provide scholarship opportunities for students and professionals. Founded in 1914, AIGA is the largest professional community of graphic designers in the U.S. Members have access to discussion boards, contests and scholarships, conferences and social events, education and training opportunities, and a career center that includes job listings. Established in 1901, SI is one of the oldest and most respected organizations in the graphic design and illustration fields. Members connect through message boards, blogs, and newsletters. SI offers awards, competitions, and educational programs, such as the Summer Illustration Art Academy. RGD supports its more than 3,000 members through certification training and networking events, including the annual DesignThinkers conference. Students have opportunities for mentorship, competition-based awards, and scholarships for school and research projects. This organization advocates for the rights of independent workers. The union provides networking events, job postings, and tax assistance. Members pay no annual fee, but they may pay for discounted health insurance plans through the Freelancers Union. As one of the largest global networks of graphic designers, ico-D maintains more than 200 member organizations in 67 countries. Members have access to shared research information and best practices, meetings, mentorship programs, and a career center. According to the Center for Financial Inclusion, student loan debt in the U.S. increased 75% from 2004 to 2014 and continues to increase. Students should prioritize affordability when considering online graphic design master's degree programs. Complete the Free Application for Federal Student Aid (FAFSA) to apply simultaneously for multiple grants and scholarships. Also look for awards from professional and community organizations, such as scholarships from the Graphic Design Degree Hub and the Graphic Communications Scholarship.